Once again, here is Mikaela modeling my latest FO. 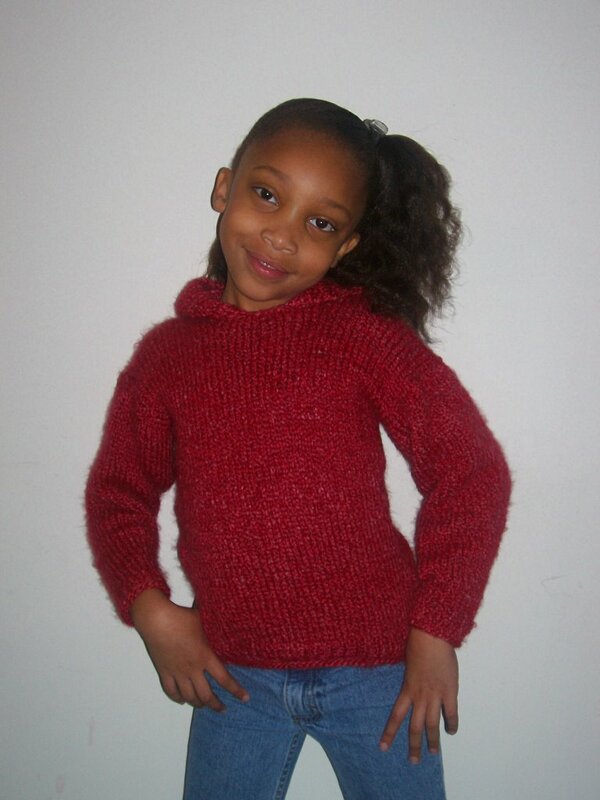 This is a red knitted hoodie, made from her special request. Very simple, first 8 rows on body and sleeves were done in a 1 x1 rib st on size 8 needles, then I changed over to size 10 needles and began stockinette st. She wanted to wear this to school today and I started on Thursday, worked on it on Friday, didn't get a chance to stitch on Saturday, worked on all I could on Sunday. By yesterday, I was pooped! By the time I got to the hood, decided to do a little cheat work and crocheted the hood. Overall, turned out really cute on her, with the exception that the sleeves could have been a little longer (she has her mother's long limbs!). Most importantly, she likes it!